The Street Fighter franchise began with a single arcade game in August 1987, but has since expanded into a global culture filled with fierce competitors, talented fans, and a rich history. On February 9, the BAIT x Street Fighter Art & Apparel Exhibition will celebrate that expansive community with a dazzling art display, the launch of exclusive products, and the legendary producer of the iconic series himself – Yoshinori Ono. The art exhibit will feature work of the Tsunami Syndicate artists, including Squidkids Ink, Wanted, Tracy Tubera, Lain Lee, Miguel Wilson, Jin Han, Linda Hong, Eric Pineda, Mark Tan, Casey Hirai, Sarah Lee, Varinya Nunez, Nomy Lowy, Daria Vinog, Whitney Paulette, Elizabeth Beals, Ed Warner, and highlighting Kwestone, Kidokyo, and Jerome Lu, who were first showcased at the 25th Anniversary Grand Finals event in December. These three artists will be present to sign autographs alongside Ono-san for the entire event. 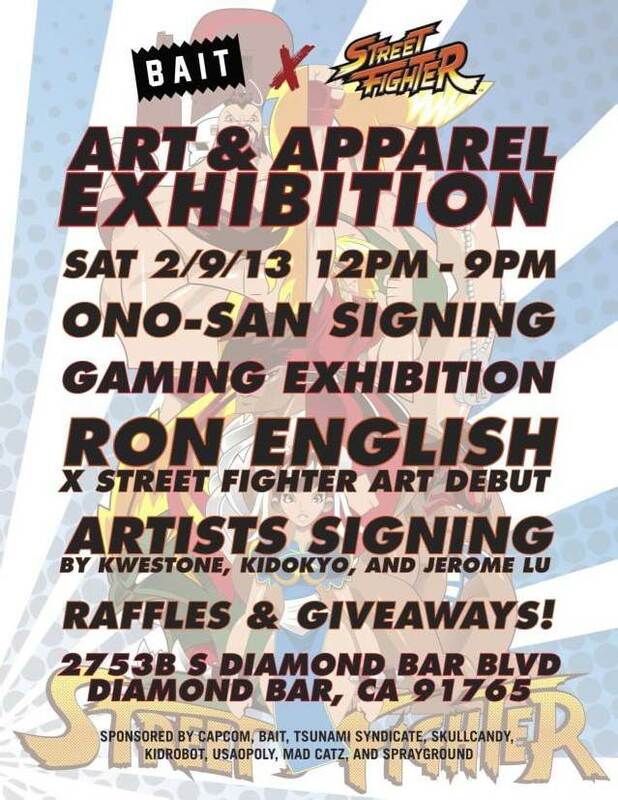 Additionally, the exhibit will feature the unveiling of the Ron English x Street Fighter project. The gaming exhibit will feature some of the top professional Street Fighter players as they show off their skills; fans will even get a chance to challenge these pro gamers throughout the event. BAIT will also launch the exclusive, limited edition Street Fighter Artist Apparel Collection featuring designs by Kwestone, Kidokyo, and Jerome Lu. The lifestyle brand will also roll out new additions to their own BAIT x Street Fighter Collection, joining the SF Championship designs from last month. The exhibit will be held at BAIT’s flagship Diamond Bar retail store on Saturday, February 9 from 12-9PM. Raffles and giveaways will be held throughout the day. Fans not in the area can catch a glimpse of the special event through a live stream on Capcom.com from 12:30-6PM.